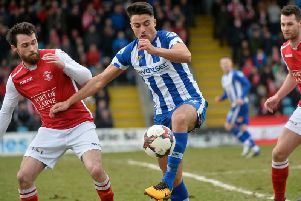 Rodney McAree is hoping his Coleraine side can replicate the performance from their last visit to Windsor Park when they visit Linfield on Saturday. It was arguably the Bannsiders best performance of the season when they beat David Healy’s side 2-1 back in November. The only down side was that they didn’t score more on the day as they dominated proceedings at the home of the Blues. McAree though knows they are facing a different proposition this time against the league leaders. “We did well the last time we were at Windsor – we are capable of playing good football. Coleraine are also on a similar run of good form with only one defeat in their last ten games. They gained revenge for that loss though on Tuesday night as they beat Dungannon Swifts 2-0 to move up to fourth in the table. “We knew it was going to be tough going there – it’s my first time coming back as a manager and it’s not an easy place to come to,” said McAree. “When I was boss there we always managed to do well at Stangmore against the bigger teams. “That’s two clean sheets in a row which is great for Chris Johns. 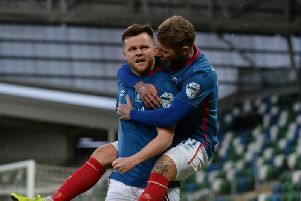 Linfield were left kicking their heels in frustration in midweek as the County Antrim Shield final fell foul of the weather. The Blues were hoping to get back to winning ways again after crashing out of the Irish Cup at the hands of Crusaders last Saturday. “You ave to give Crusaders credit though, they came and did a job,” said Linfield boss David Healy. “I can’t fault the effort of the players though, they left everything out on the pitch. “We just didn’t get the breaks when we needed to. “We want to win every game, it doesn’t matter what competition it’s in. “February was always going to be a big month for us, and a tough month. “There’s any amount of big games coming up and we need to make sure our attitude is positive to go on and finish the season strongly. “There was a lot of tired bodies after the game. “Jordan Stewart has given so much over the last while I think his body was in shut down when he came off last Saturday, his whole body was feeling it I think.